Local department stores pull out all stops when marketing Valentine’s chocolates. February 14, Valentine’s Day, is considered world over a day when romance blooms and lovers whisper sweet nothings to each others’ ears. Seemingly, there is no one in the entire world exempt from the love bug. The history of Valentine’s Day — and its patron saint–remains shrouded in mystery. Valentine’s Day as we know it today contains bits and pieces of both Christian and ancient Roman traditions wrapped in folklore. In Western countries, chocolate and flower shops do their briskest business of the year as men buy sweets and flowers to their sweethearts. And Japan is well established in that buying frenzy as well. Chocolates are a ¥75 billion industry here, with this lovers’ day accounting for about 16% of annual chocolate sales. Except, to this Western tradition, Japanese have added their own twist. 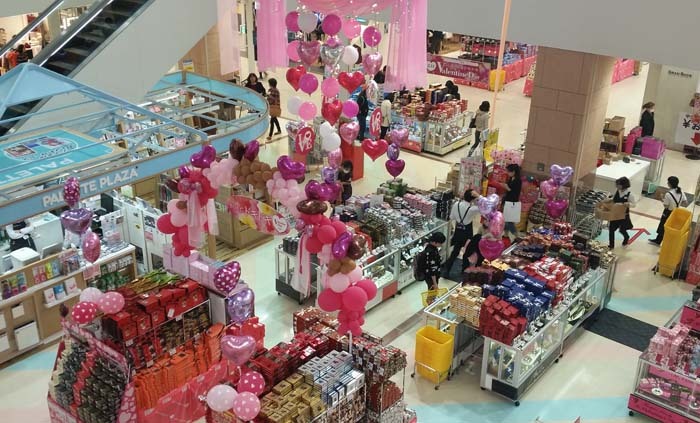 Whereas in western countries men buy the sweets to the target of their affection, in Japan it’s women who do the buying on Feb. 14th. Men then have to replicate the favor a month later on Mar. 14th, on so called White Day. Besides Japan, White Day is a custom observed in Korea, Taiwan and China. The happiest people of all in this sweet action are probably the confectioners, as a thumb of rule dictates that the value of the chocolates and other gifts to the ladies should be three times the value of what the ladies spent on Feb. 14th. Almost six decades ago Mary Chocolate Co. was the first in Japan to embrace the Valentine’s tradition in 1958, when the company started selling chocolate bars as gifts. Major Japanese confectioners, including Meiji Seika Kaisha Ltd., and Morinaga & Co., recognized the lucrative opportunity in the sweets-for-the-sweetheart market and jumped in big time in 1964. So, who was Saint Valentine, and how did he become associated with this ancient rite? Today, the Catholic Church recognizes at least three different saints named Valentine or Valentinus, all of whom were martyred. One legend contends that Valentine was a priest who served during the third century in Rome. When Emperor Claudius II decided that single men made better soldiers than those with wives and families, he outlawed marriage for young men — his crop of potential soldiers. Valentine, realizing the injustice of the decree, defied Claudius and continued to perform marriages for young lovers in secret. When Valentine’s actions were discovered, Claudius ordered that he be put to death. Another legend portends that Valentine actually sent the first ‘valentine’ greeting himself. While in prison, it is believed that Valentine fell in love with a young girl — who may have been his jailer’s daughter — who visited him during his confinement. Before his death, it’s alleged that he wrote her a letter, which he signed ‘From your Valentine,’ an expression that is still in use today. Although the truth behind the Valentine legends is murky, the stories certainly emphasize his appeal as a sympathetic, heroic, and, most importantly, romantic figure. It’s no surprise that by the Middle Ages, Valentine was one of the most popular saints in England and France.